This Retractable Awning is perfect for anyone who needs shade but doesn't want to take up a lot of room. It requires no electricity, opening and closing quickly and quietly with a simple draw string, much like window blinds. The pre-drilled holes and included mounting hardware make installation quick and easy. Designed to keep the sun off you and your home, an awning can do a lot more than just provide shade. By reducing the heat going into your home an awning will help keep your home cooler and possibly even reduce your air conditioning bills! A small foot print, ease and familiarity of use, and a great price add up to make this the perfect awning for you. Features: - Requires no electricity - Quick, quiet, and smooth open and retracting of the awning - Quick and easy installation for most installation cases Specifications: - 71" overall case - Rope Length: 7' 3" - Roller Size: 1.65" diameter - Distance from wall with drop arm: 28" - Canopy Material: 280g/m² and water-resistant polyester fabric Note: Mounting screws for wood framed homes not included. Use caution when installing on stucco exterior. Proper installation is the responsibility of the buyer. Not intended for use on recreational vehicles (RVs). Intended as sun shade only, not recommended for use in rain or other adverse conditions. ✿ This Retractable Awning is perfect for anyone who needs shade but doesn't want to take up a lot of room. It requires no electricity, opening and closing quickly and quietly with a simple draw string, much like window blinds. The pre-drilled holes and included mounting hardware make installation quick and easy. ✿ Designed to keep the sun off you and your home, an awning can do a lot more than just provide shade. By reducing the heat going into your home an awning will help keep your home cooler and possibly even reduce your air conditioning bills! 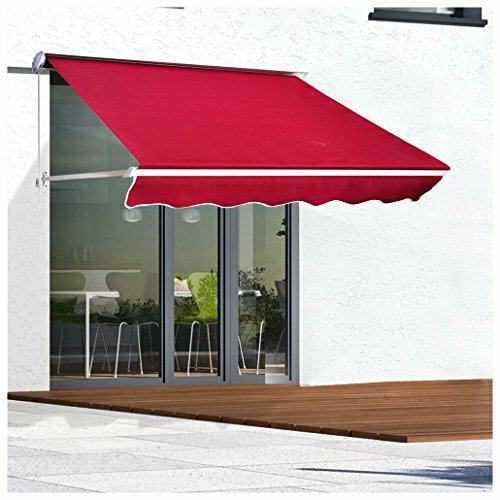 ● A small foot print, ease and familiarity of use, and a great price add up to make this the perfect awning for you. ✿ Note: Mounting screws for wood framed homes not included. Use caution when installing on stucco exterior. Proper installation is the responsibility of the buyer. Not intended for use on recreational vehicles (RVs). Intended as sun shade only, not recommended for use in rain or other adverse conditions.